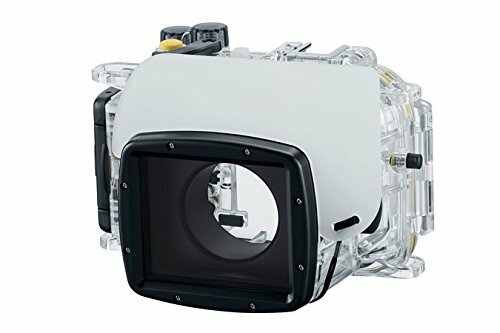 The Canon WP-DC54 Waterproof Case for Canon PowerShot G7X Digital Camera is a durable, clear underwater housing for your compact camera. It has a depth rating of 130′ (39.6 m). Simply drop the camera in and close the housing by the use of the snap closure. The WP-DC54 is configured with mechanical controls enabling get admission to all camera functions excluding for the touch panel. The WP-DC54 is constructed of clear polycarbonate and has an integrated flat glass port with an anti-reflection coating on both sides. Use an optional case weight for ideal buoyancy underwater. The housing comes configured with a cold shoe for mounting accessories. The camera’s built-in flash is usable within the housing, which comes with a flash diffuser for softening the light of the flash, thus preventing harsh light from causing glare and hard shadows. There could also be an external strobe connector. A neck strap, wrist strap, and silicone grease are included. Depth Rating: Secure to make use of at depths as much as 130′ (39.6 m). Controls: Mechanical controls provide get admission to all camera functions excluding for the touch panel. Construction. Made of clear polycarbonate. Use an optional case weight for ideal buoyancy underwater. Lens Port: Built-in flat glass port with an anti-reflection coating on both sides. Lighting: The camera’s built-in flash can be utilized inside the housing, which comes with a flash diffuser for softening the light of the flash. This prevents harsh light from causing glare and hard shadows. The housing also features an external strobe connector. Mounting: A cold shoe for attaching accessories is built into the top of the housing. Included Accessories: A neck strap and wrist strap are supplied.